Always wanted to learn to dive? Then you must go to Koh Tao, the best destination in Thailand to get your PADI diving certificate. There are over twenty-five great dive sites, a large number of international dive schools, and it’s dirt cheap. And the island itself is amazing with gorgeous beaches and hip beach bars. So get your PADI and discover the wonderful underwater world of Koh Tao! Covering 21 km², Koh Tao is only a small island in the Southeastern Gulf of Thailand. Yet the diving possibilities are amazing! Around the island, you’ll find beautiful coral reefs, large schools of barracuda and even whale sharks. You can spot rays under rocks, and colorful fish like the Parrot Fish and Yellow Box Fish. Koh Tao means turtle island, so your chances of spotting a turtle are high. And to enjoy all this beauty, you don’t even need to be an experienced diver; it’s possible to see all this during your very first dive. Besides diving, Koh Tao has much more to offer. You can wind down on one of the many beautiful sandy beaches. Or chill out in one of the hip lounge tents along the shore. The island is renowned for its wonderfully relaxed atmosphere, so you’ll surely enjoy yourself in between dives. I traveled to the island and literally submerged myself in the diving world. I signed up to get my diving certificate, or PADI Open Water course, with Ban’s Diving Resort at Sairee Beach. And I liked it so much that I immediately took the Advanced Open Water afterward as well. Are you thinking about going diving on Koh Tao? In this blog, I will tell you about what you can expect. I’m sure that all your doubts are gone after reading this! 6.1 What can you do with your PADI Open Water? Koh Tao is all about diving. The island is not only the best place in Thailand but maybe even the best place in the world to get your PADI. And that’s because of a few factors. For one thing, there are numerous dive sites and dive schools; which means loads of competition and low prices. Koh Tao has about twenty-five different dive sites, which makes the island attractive to both beginning and experienced divers. Most of these dive sites lie eighteen meters deep, making the offerings for beginners very broad (with your PADI Open Water you can dive up to eighteen meters deep). If the weather is good, visibility around Koh Tao is up to fifteen meters. You’ll find dive schools in all forms and shapes across the entire island. Further down in this article I will talk more about the best-rated schools and those offer courses in different languages. Koh Tao is one of the cheapest destinations in the world to get your PADI. Because of the wide range of dive schools, competition is fierce, which you will notice in your wallet. Dive courses cost significantly less than in the rest of the world – and even compared to other destinations in Thailand. Shortly I will tell you exactly what the costs are. Koh Tao is a real divers island. Almost everyone comes here for one thing: diving. And how fun is it to chat with your newfound friends about your day’s experiences in the bar at night? In short: Koh Tao is the best destination to get your PADI. However, that doesn’t automatically mean that it’s also the most beautiful place for diving in Thailand. It’s certainly gorgeous, but there are places in Thailand that are even more beautiful. Remember that diving in places such as Koh Lipe, Koh Lanta of Koh Chang is a lot more expensive. They’re also less accessible to beginners. Diving at a depth of eighteen meters within four days? It may seem a bit daunting, but thanks to the step-by-step method of this course you will be swimming eighteen meters deep among beautiful fish and coral before you know it. There’s a lot to do before you can disappear below the surface. That’s why the course begins with an evening theory lesson. For about 2.5 hours, you’ll learn about the basics of diving through informative videos. Among other things, you’ll get to know the equipment, learn the basic rules and what to do in case of an emergency. Boring? Absolutely not! Thanks to this theory lesson, you will be much more secure the next day when you’re in the water. It is, moreover, the perfect occasion to get to know your fellow participants. After this evening, you’ve gotten about half of the theory. There are two short theory lessons on day two and three, after which you’re entirely ready for the written exam. During this evening, you will also get a first knowledge test about the theory you just learned. This test is merely a preparation for the exam. But first… into the water! Get your bikini or swimming shorts ready because you will have your first dive in the pool at 8.00 am! After carefully assembling your equipment, of course under the supervision of an instructor, the first exercises begin. There’s no reason to be tense or to panic because everything happens step by step and at your own pace. In shallow water, you will first learn how to operate the breathing regulator. You will notice that the first time underwater feels very weird! That’s only normal because suddenly you will breathe in a completely different way. At first, you might even feel like you’re short of breath. Don’t worry though, after a few exercises breathing underwater will become more comfortable and easier. Additionally, you will learn how to handle your goggles. What do you do in case of fogged goggles or what about when your goggles fill up with water? The instructor does several exercises with you to prepare you for every situation. Diving always happens in ‘buddy teams’. This means that you always dive together and that you keep an eye on each other and provide help if necessary. During the course, you’re partnered up with your buddy, one of your fellow participants. Together you will do several exercises in the pool. Such as what to do if your buddy runs out of oxygen. Sounds serious, doesn’t it? Luckily, it’s not that bad, these situations rarely happen. But when everyone is prepared for emergency situations, you will notice that you’re much more confident when you dive into the water. Eventually, you will move to about three meters of depth in the pool. This is where you will learn to deal with the pressure on your ears for the first time. Pain in the ears is often the first thing people worry about. That’s logical because many people feel their ears on a plane or in the pool. Let alone during a dive. During the course, you will learn how to deal with this. Thanks to useful tips and tricks, you can clear your ears at any depth and descend to eighteen meters free of pain and worry. Day two ends with about an hour-long theory lesson through a video. The instructor will also summarize all contents of the previous lesson and go over the answers of the knowledge tests. Day three: Twelve meters deep, here we come! Make sure to set your alarm on day three, because at 7.00 am it’s time for your first couple of real dives! Two dives are planned this day going to a maximum of twelve meters deep, during which you will put into practice all theory and pool exercises. Healthy nerves are normal during this morning. After all, you don’t get to explore the underwater world every day. Once again, everything is repeated step by step – so worries aren’t necessary. But that doesn’t mean that the first time you jump off the boat and into the water, wearing all your equipment, is not super-thrilling! Once everyone is in the water, the whole group and the instructor will descend to the bottom. All at your own pace! Both dives last about forty minutes, and in between, you have about an hour-long break on the boat. You will do a couple of underwater exercises, but mainly you’ll be swimming around and searching for that marine life. At noon, the instructor has the last theory lesson for you, lasting about one hour. And then… you’re ready for the written exam. The exam itself is doable, after all that theory and summaries from the instructor, you’re more than prepared to answer those fifty questions. Did you get twelve or fewer questions wrong? You’ve passed! In case you didn’t pass the exam the first time, you can retake it the same day including an extra lesson from the instructor. This, however, almost never happens. The theory was finished on day three, so today is all about diving. Yay! On day four, you will do two dives again, one of which will go to eighteen meters deep. This is the maximum depth you’re allowed to dive to with your PADI Open Water. The start time on day four is 7.00 am once again. Both these dives also last about forty minutes with an hour-long break in between. During these dives, you will do a couple of exercises, but the primary purpose is enjoying the underwater world. Who knows, maybe you’ll spot a turtle or a ray! Around lunchtime, everything’s over, and you officially passed your PADI Open Water diving course. Congratulations! As I said before, diving on Koh Tao is very cheap. For your PADI Open Water at Ban’s Diving Resort, you’ll pay 9,800 baht, about 295 US dollars. That includes a four-night stay at the associated resort. The price for this course is pretty much similar at all dive schools on the island, so make sure that you don’t pay a lot more or a lot less somewhere else. This is often an indicator that something’s wrong with that dive school. Yes, in Spain you’ll pay around 350 US dollars for your PADI, Belize 400 US Dollars, and in Australia 700 US dollars. And on other Thai islands, you will pay 15,000 baht (around 450 US dollars) on average for this diving course. The range of dive schools on Koh Tao is wide, but not all of them have instructors speaking different languages. Because there’s a significant part of theory lessons, a course in your language is recommended. This makes learning much easier, causing you to feel more self-confident during the PADI course. These two dive schools are well-rated and employ instructors from all over the world. I took my diving course at Ban’s Diving Resort, and I really liked it! With more than a hundred instructors, this dive school is one of the world’s largest dive schools and is renowned on the island. Additionally, Ban’s has a large team of divemasters, speaking English, German, Swedish, Dutch, Thai, Hebrew, Danish, Japanese, Korean, Cantonese, Spanish, French, and Italian. The instructors are well-trained, patient and really friendly! So count on your course also consisting of a fun dinner with the entire group and instructor. Ban’s has a large and beautiful resort with a restaurant, four pools, a supermarket, a massage parlor and a bar. In the evening, the Fishbowl Beach Bar is one of the most popular bars on the island. Every night, there’s live music from 8.00 pm. And from 11.00 pm a DJ starts playing tunes and the bar transforms into one huge beer pong tournament. Ban’s is very centrally located, in the heart of popular Sairee Beach. Interested in diving at Ban’s? Get in touch here. Assava Dive Resort’s team of instructors come from all over the world and provides diving courses in many different languages. The entire resort was recently renovated and is therefore definitely worth visiting. Assava lies on the other side of the island, which makes it the perfect dive school if you’re looking for some more peace and quiet. Perfect if you want to go diving with your family. The courses at this dive school also come with four nights at the resorts. This is probably the most well-known sickness in the diving world, even though it rarely happens. You see, it’s easily preventable! If you adhere to the rules you’re taught, the chance of getting decompression sickness is non-existent. Decompression sickness happens when you ascend too fast. The nitrogen that you breathed in during the dive cannot be removed efficiently in that case, which may cause the forming of bubbles in your blood. Depending on the location of the bubbles, they may cause itching, joint pains or even problems with your heart, lungs or brain. During your PADI Open Water, you will learn everything you need to know about this sickness, how to prevent, recognize and treat it. Stopping by the massage parlor after an intensive dive is tempting. This is, however, extremely discouraged because it increases the chance of getting the decompression sickness as mentioned above. After a dive, you have to wait about six hours before getting a massage. During a massage, possible nitrogen bubbles that remain in your blood can be transported through your body. After six hours, all nitrogen is gone and you’re good to go again. Also called “the rapture of the deep”, nitrogen narcosis is virtually harmless. The deeper you dive, the higher the chance of getting nitrogen narcosis. Usually, this only happens at depths of twenty-five meters or more. That boundary is, however, different for everyone and not all divers suffer from this condition. Nitrogen narcosis involves your brain not being able to handle the amount of nitrogen that you breathe in and, as a result, it won’t work as fast as it typically does on land. It feels as if you’re drunk. Thinking requires much more effort, and a simple math equation can seem impossible! When you calmly ascent again, your brain will start functioning normally again, and there will be no permanent damage. Of course, you will learn about nitrogen narcosis during your course. In extreme cases, when you ascend too fast, you can rupture your eardrums or get a collapsed lung. The same applies here, stick to the rules you learned and ascend slowly – then the chance of suffering this kind of injury is zero. The risks may seem serious. But when you stay calm and adhere to the rules, there is no reason to panic. Each participant must sign the medical statement of PADI at the beginning of the course. With this, you declare to be healthy and shouldn’t be at risk during the dives. Do you take medicines or do you, for example, suffer from allergies, hay fever or asthma? This doesn’t necessarily mean the immediate end to your diving career! Contact your doctor before going to Thailand. He or she knows your medical background and can tell you exactly whether or not you’re allowed to dive. Got a green light? Make sure that your doctor writes and sign a medical statement and take it with you. You have to submit it with the dive school. The dive school will also ask that you visit a Thai doctor, which is mandatory for insurance reasons. You can arrange this check-up via your dive school and only lasts a few minutes. It does cost you 200 baht, though. Are you suffering from a severe cold or the flu at the time of your course? Unfortunatly, you’re not allowed to dive, and you will have to wait until you’re better again. There are some age requirements with regards to getting your PADI Open Water. From 10 years old, you may take your Open Water course, but only up to twelve meters deep. From 15 years old, everyone can get their certificate for the maximum depth of eighteen meters. When you’re diving independently, most travel insurance policies require you to get additional coverage. Contact your travel insurer about this before you leave for Thailand. However, when you take a course at a dive school, such as Ban’s Diving Resort, insurance is usually included. When you book your course, check thoroughly which insurance policies are included in the price. You got your PADI, what now? From now on, you can dive anywhere in the world up to eighteen meters deep. Of course, you always have to dive with a buddy. This can be a friend or acquaintance, or someone from a dive school. In Thailand, about thirty percent of the dive sites are at eighteen meters deep. So, you can certainly do a number of beautiful dives with your Open Water! For example, as a beginner you’ll find plenty to do on Koh Samui or Phuket. It is recommended to always do these dives via a local dive school because they know the most beautiful spots. But there’s more than just your Open Water! After your Open Water course, you can start the advanced course: Advanced Open Water. During this course, you will learn how to dive to a depth of no less than thirty meters in two days. After taking this course, you can dive at about ninety percent of all dive sites in Thailand, which is kinda cool! Besides, you will meet different fish at thirty meters. The biggest difference? The fish are much larger at this depth. 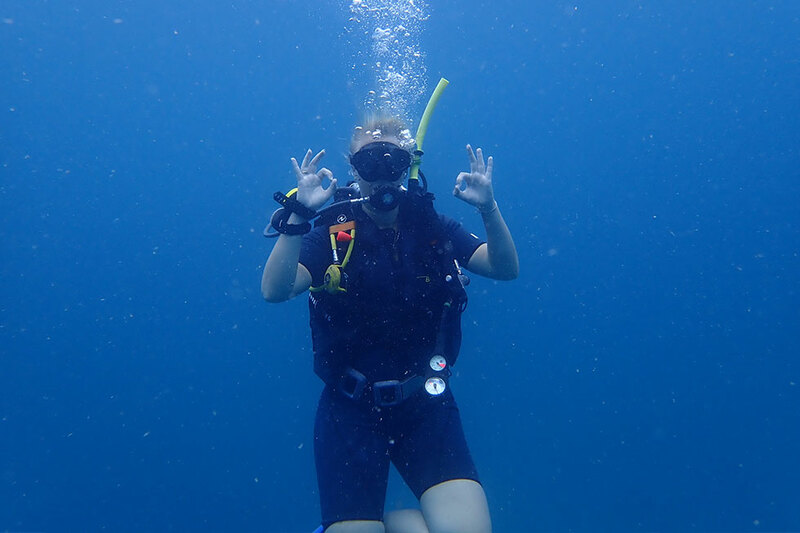 During my stay at Ban’s on Koh Tao, I immediately started my Advanced after completing my PADI Open Water, which is something I certainly don’t regret. The Advanced Course makes you an independent diver. This course goes more in-depth into developing your underwater skills. For example, you will learn to navigate underwater, look closer at marine life and you’ll even learn how to dive at night. After this course, you will be skilled enough to dive independently, but still always with a buddy. It is, however, always a good idea to explore a new dive location with a dive school. They will guide you and ensure that you don’t miss anything beautiful underwater. The Advanced Course consists mainly of diving; there’s only a small part of theory on the first morning. After that, you’ll go for no fewer than five dives in two days! During your first dive, you will descend to thirty meters and meet a whole new underwater world. With some luck, if visibility is good, this dive will take you to the HTMS Sattakut Wreck. This wreck is a former marine ship that was used by the American navy in Japan during the Second World War. Later that day, you will do another dive, during which you learn how to navigate. You will get a compass, and together with a buddy, you will study the map of the dive site beforehand. And then you’re on your own! The goal is that you and your buddy navigate underwater and resurface at the boat after a dive of about forty-five minutes. A challenging task. That night, or possibly the other night depending on the schedule, you will also do a night dive. Exactly, in the dark! Around 6.00 p.m., which is when it gets dark in Thailand, you will travel to the dive site to descend to the bottom during sunset. This is when you’ll experience the underwater world in a completely different way! Of course, you’re equipped with a flashlight, and the instructor always keeps an eye on you. On the last day of the course, you’ll do two more dives, but now it’s all about having fun. You will notice that you’re more independent in the water and much more aware of your surroundings. The PADI Advanced Open Water at Ban’s Diving Resort costs 8,500 baht (about 225 US dollars), but if you got your PADI Open Water here, you’d get a 10% discount. And this course, too, comes with a two-night stay at the resort. Koh Tao has tons of amazing dive sites! There are more than twenty-five different places in total, of which you’ll visit a few during your PADI Open Water. Which places you will visit is in the hands of the captain of the boat. He determines what the best places for diving are, based on the weather. All sites feature remarkable fish, plants, and coral and they’re all worth visiting. But there are a few that stick out from the rest. Such as the HTMS Sattamuk Wreck, where you can spot gigantic fish and maybe even Jenkins Rays in and around the shipwreck. And if you’re lucky, you might spot whale sharks at Chumphon Pinnacle. White Rock is one of the most colorful dive sites on Koh Tao and is impressive during a night dive. Interested in these dive sites? Check out our top 5 best dives of Koh Tao here. Do you have to buy something? Technically not, all equipment and necessities are provided during your course. It can be handy, though, to purchase a waterproof bag. This allows you to keep your valuables dry. Waterproof bags are sold all over the island. Taking your course at Ban’s Diving Resort? Then you’ll get a 10% discount on all bags in the resort’s shop. The best time for diving on Koh Tao is between February and June, but you can technically dive throughout the year around the island. During the rainy season (November through February) visibility may be a bit less. Can you fly after a dive? Take into account that you’re not allowed to fly for eighteen hours after a dive. This is to reduce the risk of decompression sickness. Think about this when booking any return or onward flights. Flying before diving is not a problem. Book in advance or locally? When you want to secure a spot in a specific language group, it’s recommended to book in advance, especially during European holidays in July and August. Between dives, you have plenty of time to relax and catch your breath after those physical efforts. Don’t be mistaken; diving requires tons of energy. Koh Tao is small but nice! You don’t have to get bored in between dives here. But watch out, don’t go into the bars until the wee hours and stick to a couple of beers in the evening. Diving with a hangover is no joke, being underwater is, after all, not the place to suddenly feel nauseous. Climb to one of the many viewpoints on the island for a beautiful view. Rent a motorbike and check out Mango Viewpoint or John-Suwan Viewpoint, for instance. Or go for dinner at Barracuda, located right next to Ban’s Diving Resort. The restaurant offers a stunning view during sunset and has an entire menu specialized in fish and seafood. Order tapas or get the three-course dinner for only 390 baht. Fueling up for you dive? Grab breakfast at Blue Water in the middle of Sairee Beach. Stick your feet in the sand and order a freshly made smoothie or French toast with banana and chocolate. Looking for a lasting memory? Get a bamboo tattoo! Thanks to the particular technique used by the Thai to do this, you can go swimming the next day. Koh Tao Bamboo Tattoo is well-rated on the island. I got the diver’s bug – and I don’t mean decompression sickness! After diving intensively for six days, I know I want to do this much more often. Not only on Koh Tao but also in the rest of Thailand. But those nerves disappeared after the first minute underwater! We prepared thoroughly during the first two days of the course, and everything went very smoothly. The instructors take time to help you and make sure that you never have to feel tense. I liked diving so much that after getting my PADI Open Water, I immediately continued with my PADI Advanced Open Water. In total, I was able to do seven dives during my two courses. And I saw so much! During my second dive, I already came face to face with a sea turtle, and on the first day of my Advanced course, we descended to the enormous HTMS Sattakut Wreck. The theory involved in the course wasn’t too bad at all, after the theory lessons, you’re entirely ready for the written exam. You don’t have to study extra for this and during my two-week stay on Koh Tao, I never heard of anyone failing the exam. No reason to stress out, in other words! You often hear that people are scared of diving because of their ears. I, too, had the same worries before. Whenever I wanted to get something from the bottom of the pool, I always felt my ears. But on the first day of the course, I discovered that this is not because of sensitive ears, but because of a lack of knowledge. Once you learn how to deal with the pressure on your ears, and learn how to clear your ears, you don’t have to worry about anything anymore. Eventually, I was able to descend to thirty meters without any problems! During my diving courses, I stayed in a room at Ban’s Diving Resort, which is included in your course after all. This is a resort that feels very welcoming! Ban’s is a large dive school with lots of guests and employees, making it feel like a small village. Everyone knows each other, and everyone is nice to each other. There’s always someone in the bar up for a chat or asking you how your dive went that day. Taking a PADI Open Water course is a considerable investment regarding time. Especially when you decide to also take the Advanced course afterward. In total, this will cost you six days. But in exchange for those six days, you can continue to dive for the rest of your life. Your PADI stays valid forever! Besides, taking the course doesn’t mean that you can’t do anything else on the island. During the course and in the evenings, you have plenty of time to explore the island. And trust me, a stay of minimum six days on Koh Tao is not a punishment! So, stop doubting and seize this opportunity to get your PADI on Koh Tao. I promise you that you won’t regret it! Simple Life is simply awesome. The location in the town center, with its many restaurants, shops and nightlife hotspots, is ideal. Plus it’s only a few minutes away from Sairee Beach. The rooms are pretty, breakfast is big and included in the price, the staff is incredibly friendly and the swimming pool is a very nice bonus! Luxurious Sensi Paradise Resort on Koh Tao has a view of Mae Haad Beach, where you can go snorkeling from the beach. This is one of the best locations of Koh Tao - only a 5-minute walk away from the center. Boat trips to other parts of Koh Tao and surrounding islands can be arranged at the reception. Will you go on your very own diving adventure in Thailand? This article was created in collaboration with Ban’s Diving Resort but concerns our own, independent opinions and experiences.